"Marvel Guardians of The Galaxy Drax Figure, 6-Inch"
The vendetta that drives Drax the Destroyer knows no limits: he will avenge the loss of his family no matter the cost! The Guardians of the Galaxy need all the help they can get to save the cosmos from destruction and this is your chance to build them a mighty ally! 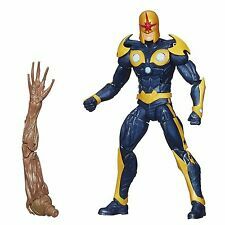 "Marvel Guardians of The Galaxy Star-Lord Figure, 6-Inch"